Tevar (English Meaning : Attitude) is an upcoming Bollywood film directed by Amit Sharma and written by Gunasekhar. The film stars Arjun Kapoor, Sonakshi Sinha and Manoj Bajpayee in lead roles. It is a remake of 2003 Telugu Blockbuster Okkadu starring Mahesh Babu. The film is scheduled for release on January 9, 2015. 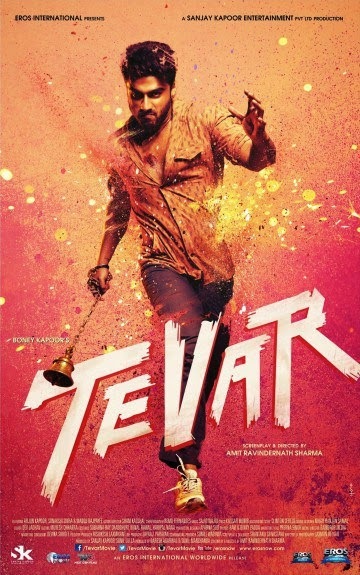 The shooting of the film"TEVAR" began on 21 January 2014 at sambhar lake in Jaipur, Rajasthan.The film's shooting continued in different locations including Mumbai, Maheshwar, Agra, Mathura,Pandharpur at river side of Chandrabhaga and also in Haridas ves in Pandharpur (solapur,Maharashtra) Akluj (Solapur,Maharashtra) .The first look of the movie was released on 19 February 2014. Pintoo Shukla, is a young Kabbadi player who goes to factionism hit to take part in a life changing match, which decides his sports future. There, in a twist of fate, he saves Radhika , from Gajendar Singh, a dangerous faction leader, who is in love with Radhika and wants to marry her against her wishes. Pintoo tries to comfort her because Gajender Singh killed both brothers of Radhika. Pintoo brings Radhika to his house in Mumbai and decides to send her abroad to save her from Gajender Singh. This is complicated by the fact that Radhika falls in love with Pintoo and that Pintoo's dad is the top Cop in charge of finding Radhika, as per the order of corrupt home minister of the state. The home minister is into helping Gajender Singh.Pintoo conceals swapna in Akluj, this forms an integral part of the story. Whether Pintoo is able to achieve his Kabbadi target and whether, Radhika & Pintoo unite is the crux of the story.